Here at Pro Football Focus, we keep track of everything that happens on a football field. Every player on every play of every game. Thanks to that, we’ve got a tremendous database just loaded with football goodness. We’re going to dive into that database and take a look at which receivers were the most productive last season on individual routes. The metric we’re using to rank these players is wide receiver rating. 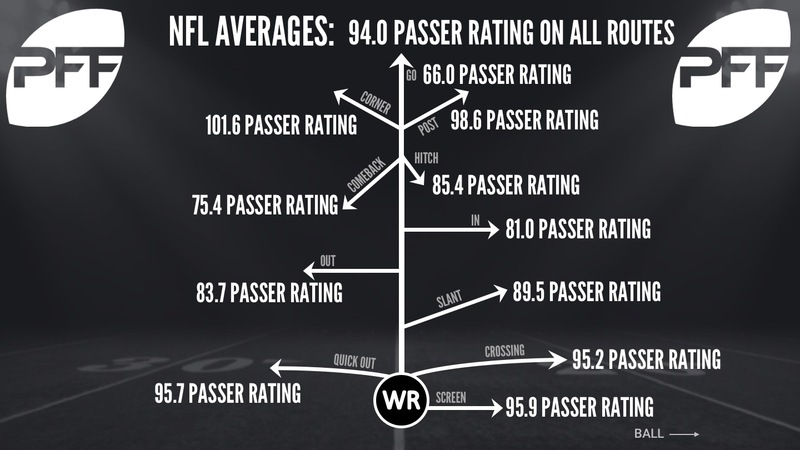 Simply: WR rating is the passer rating that a quarterback earns when throwing to that receiver. Some context here, these are the numbers each receiver saw on the very basic of our route tree definitions. 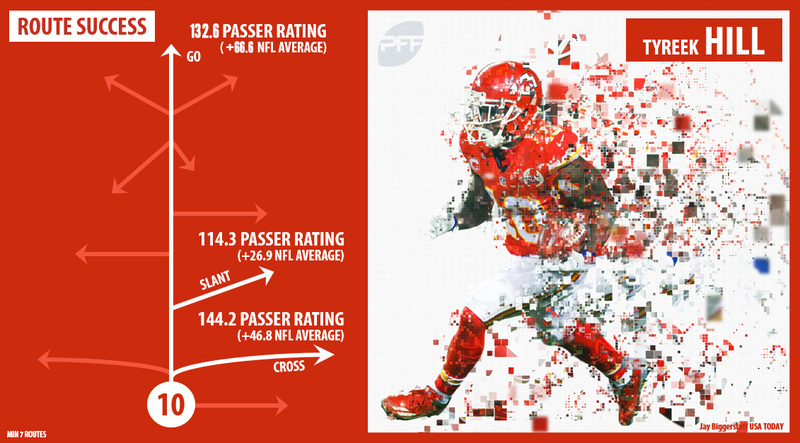 At PFF, we have multiple modifiers for routes that are broken off, combination routes and specialized routes by design like a ‘back-shoulder go.’ The numbers below are just based off the basic design and execution of each route, not inclusive of combination routes, specialized routes or modifiers. Hopkins had the highest passer rating on wide receiver screens among any receiver who had at least 10 targets. Hopkins caught 10-of-10 targets for 132 yards, five first downs and a touchdown. There were 18 players last season who received at least 10 targets on speed outs, Ellison led that group with a 131.8 WR rating on the route. He hauled in 10-of-11 targets for 92 yards, four first downs and a touchdown. There were 37 players in 2017 who were targeted at least 10 times on slant routes, Agholor was the only receiver among that group to have a WR rating north of 130.0. Agholor caught 9-of-11 targets on slant routes for 102 yards, three first downs and a touchdown. There were 1,828 out routes thrown last season, compared to 1,197 slants, 899 quick outs and 862 wide receiver screens, so we’re raising the threshold here up to 15 minimum targets with this route. There were 36 receivers in 2017 who were targeted at least 15 times on out routes, among that group Sanu led them all in WR rating. He hauled in 20-of-25 targets for 194 yards, eight first downs and three touchdowns and with two of the five incompletions deemed uncatchable. There were 24 receivers to get at least 10 targets on in routes last season, Cooks was the only player to have a WR rating of at least 120.0 on the route. The Patriots receiver brought in 9-of-16 targets for 175 yards, five first downs and two touchdowns. Four of the seven incompletions were deemed to be uncatchable. There were only 303 targets thrown to comeback routes last season, only 16 receivers saw at least five in their direction. Thielen led the group in terms of WR rating, and he was just one of three receivers to produce a rating of at least 100.0. The Vikings’ receiver hauled in 5-of-6 targets for 66 yards, with four of those five catches resulting in a first down. Hitches were the most popular route in the league last season with 2,343 total attempts and 23 receivers saw at least 20 targets their way. Thielen was one of two receivers to produce a WR rating of at least 120.0 on at least 20 hitches, he hauled in 24-of-32 targets for 277 yards, 11 first downs and two touchdowns while six of the eight incompletions were ruled uncatchable. Corner routes were only thrown 425 times last season, just 26 receivers saw at least five targets on the route. 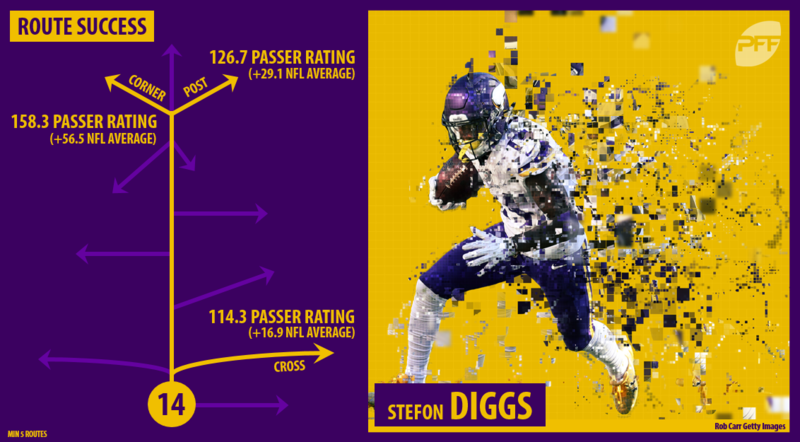 Diggs was one of those receivers and he’s the first guy on this list to produce a perfect rating on an individual route. The Vikings’ receiver hauled in all six of his targets for a total of 208 yards, one first down and four touchdowns on corner routes. There was similar usage of post routes to corner routes in 2017, with 486 total attempts and 16 receivers seeing at least seven targets on the route. Woods produced a perfect WR rating by hauling in 6-of-7 targets for 188 yards and a touchdown, with all five of his other catches resulting in a first down. There were 888 ‘go’ routes thrown in 2017 with 25 receivers being targeted at least 10 times on the route. Hill was one of two receivers to produce a WR rating of at least 130.0 on flys. The speedy receiver hauled in 7-of-15 targets for 353 yards and three touchdowns, five of his eight incompletions were deemed uncatchable. The second-most popular route of 2017, there were 2,073 crossing routes attempted last season with 39 players seeing at least 15 targets on the route. Gronk hauled in 21-of-27 targets on crossing routes last year for a total of 335 yards, 17 first downs, and two touchdowns. All six of the incompletions were deemed uncatchable.